Here I show an illustration from a 1597 manuscript by the German Martin Sturtz. It bears the Latin title 'De humido radicali' though it is written in German. In this case we know exactly what it is meant to represent as Martin Sturtz created it to illustrate the Emerald Table of Hermes Trismegistus alongside which it stands in the manuscript. 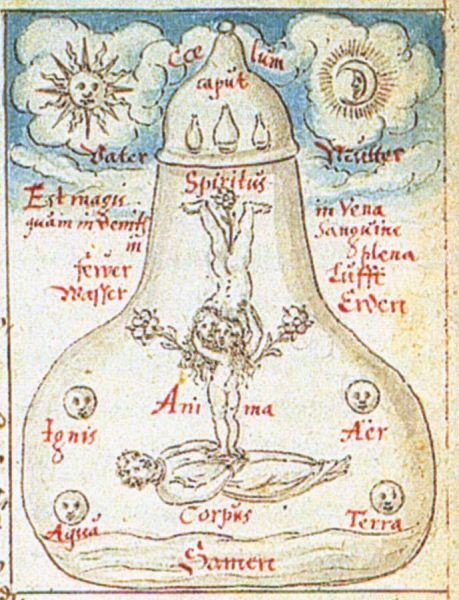 At the top are the Sun and the Moon, labelled Father and Mother. The Emerald Tablet states "The Sun is its father and the Moon its mother". These are placed in coelum (heaven). The tablet further states "That which is below is like that which is above and that which is above is like that which is below" so Sturtz has presented this lower world in the form of a flask. "The wind bore it in its womb. Its nurse is the earth". In this flask are the four elements, set above a lower layer which can be seen as the earth. In this earth is the word Samen (seed). In the space of the flask we see three figures. The one lying prostrate in the corpus (the body). Standing upon the body is the Anima (the soul), here a female figure. She reaches up and embraces the figure of Spiritus (the spirit) who is descending from the heights of the flask. The Emerald Tablet states "This ascends from the earth into heaven and again descends from heaven to the earth, and receives the power and efficacy of things above and of things below". The mutually embracing figures is a rather fine pictorial realisation of this idea. They have three flowers around them. We also see three little flasks in the head of the larger flask. Together with the three flowers these perhaps picture the phrase "I have the three parts of the wisdom and philosophy of the whole universe". The text around the flask appears to state "It is to a great extent in the vein, that you will find blood in plenty." This is a rather more cryptic statement that I cannot clearly relate to this image. Perhaps it refers to something mentioned in Sturtz' text. In the understanding of medicine during the 16th century, it was considered that the child grew in the womb from the male seed being nourished by the female blood. Perhaps this is the idea that is being presented.